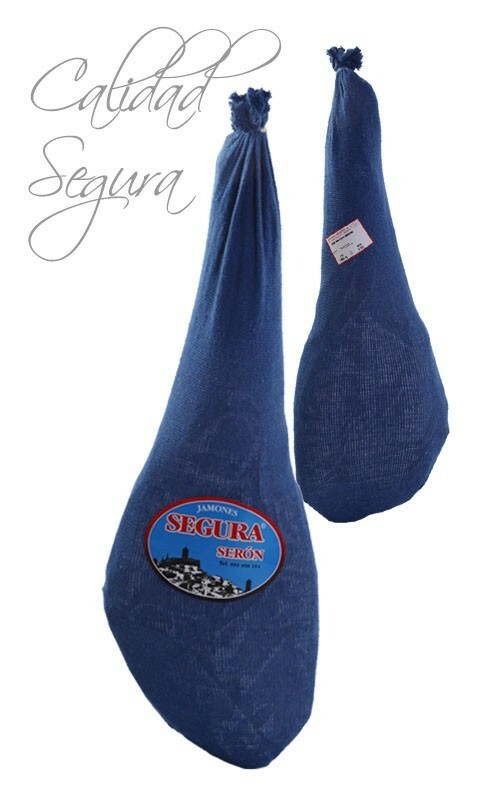 It is a delicious Serrano Ham from Sierra de Los Filabres ( Seron ). 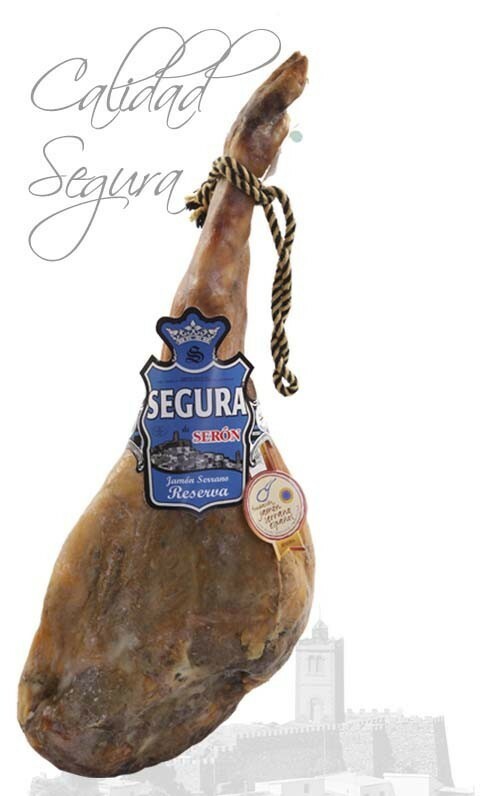 This Serrano ham with a natural cure between 12 and 15 months with a fat content which gives it a very nice texture and flavor. The unique conditions of this location and the process of curing give it a unique flavor that will delight you and your guests. It is ideal for a healthy and balanced diet. 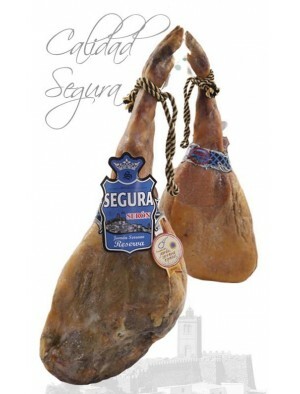 Serrano Ham with Gold Label is made from salting and drying of the hind legs of the pig. The back label accompanying this Ham ( Gold Label ) falls within the rules of the Serrano Ham Foundation indicating that a product is defined as Traditional Speciality Guaranteed (TSG) and not only certifies that the product meets the quality requirements contained in the specification, but ensures the curing process of the product, all this verified by Independent Control Entities. Similarly, the product is guaranteed by the ISO 22000 certification. White pigs fed with natural feed made from cereals . The Natural Curing process takes place in the Natural Drying of Sierra de los Filabres, particularly in the small town of Seron during a period between eleven and fourteen months. The ideal consumption period covers up to six months after your purchase. The ham is delivered in a cardboard box, clearly identified and dressed in a white fabric lining that you can use later for conservation. Includes a cord to hang the piece. 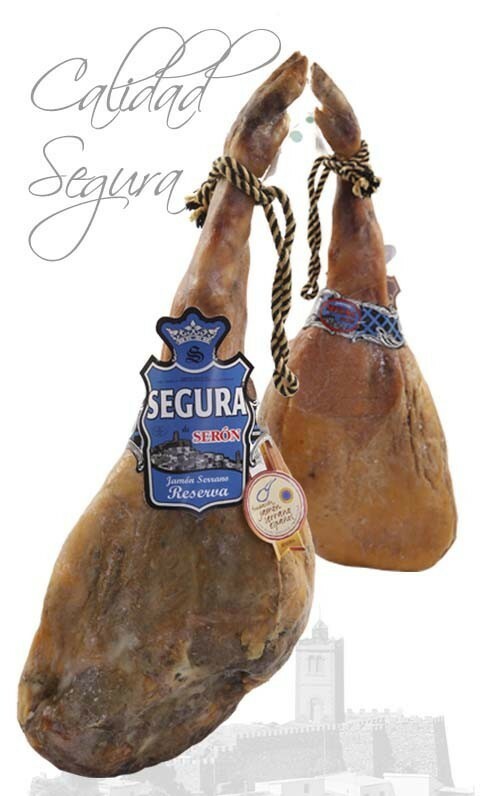 It is imperative to use a support and a special knife to cut ham, in addition to fully enjoy its flavor, we recommend following the steps in our guide to cut Serrano Ham. Curing: From 12 to 15 months of natural curing process.